An informal happy hour event for UNMC/NM LGBTQ+ employees and allies will be held off-campus at Stirnella Bar & Kitchen. This is a chance to meet fellow employees, including subcommittee members of the LGBTQ+ Employee Alliance. Look for the table with the UNMC/NM sign. All are welcome. Who is the LGBTQ+ Employee Alliance Group? The UNMC and Nebraska Medicine LGBTQ+ Employee Alliance Group strives to promote an accepting and diverse culture across the enterprise for all LGBTQ+ employees and allies. In addition to providing mentoring and peer support to LGBTQ+ community members at UNMC and Nebraska Medicine, our activities aim to promote the well-being of LGBTQ+ faculty, students, and staff, as well as to facilitate on-campus educational efforts regarding LGBTQ+ issues. Membership in the group is open to all UNMC and Nebraska Medicine faculty, staff, residents, and students. Whether you're a member of the LGBTQ+ community or an ally, you are welcome! 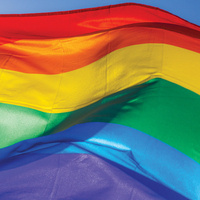 Visit unmc.edu/lgbtq for more information.